Whenever I walk into a home improvement store, I always stop at the light fixtures section – even when I don’t need one. The thing is, I love looking through all the great designs, especially the table lamps. That is why it is hard for me to believe that decorating with table lamps is often an afterthought. Aside from providing light to a room, the right table lamp can also do so much to create ambience and enhance its style. One of my favourite pastimes is watching TV shows with popular interior designers and their brilliant ideas for lighting a room and tips on how to decorate with table lamps. Here are some of the helpful tips I’ve have learned from them. One thing that you should always avoid is buying table lamps first and then try to fit them into your home. While it might work, you can end up with table lamps that are too tall, short, or bright to the room. So, make sure you define the purpose of the lamp before you start shopping for it. Start off by determining where you want to put the lighting, and measure the exact height at which it will sit as well as the distance from the couch, bed, or the cozy chair next to it. Here is one thing to keep in mind when choosing a new table lamp: the height of the table lamp you choose is determined more by the room it will be placed and the décor around the lamp. For example, if you have a tall bedside table, a shorter lamp might be the best option and vice versa. The rule of thumb here is to select a lamp where the bottom of the shade is at your eye level when you are seated or resting. This rule works whether you are buying a table lamp to go next to the couch in the living room, to fit your reading nook, or a bedside lamp. Some of you reading this article might wonder if a table really has a style of its own, and I can tell you – Yes! Very often it is the shade that determines the overall appeal of the lamp, but there are many cases where the body of the lamp makes the whole difference and defines it. 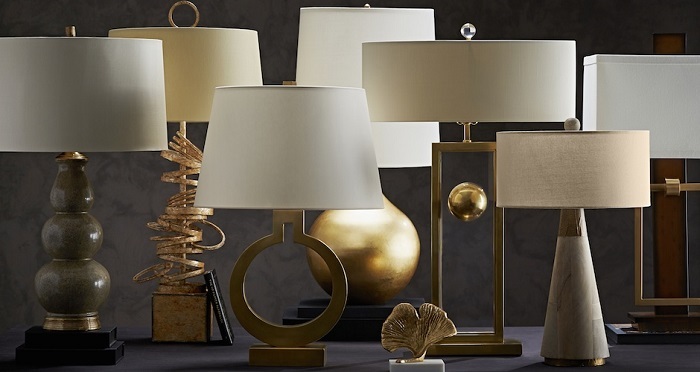 With the variety of table lamps available, you should have no problem finding the perfect fit for the exceptional and exclusive style of your home. Or do what the experts do sometimes – use a table lamp to blend in a completely different style and give the room a stunning focal point. Some table lamps allow the shades to be changed with ease, so check this feature to be able to switch the lampshade in the future. Also, make sure that the table lamp supports the switch between CFL’s and LED lighting – LED lighting helps cut down the power bill.